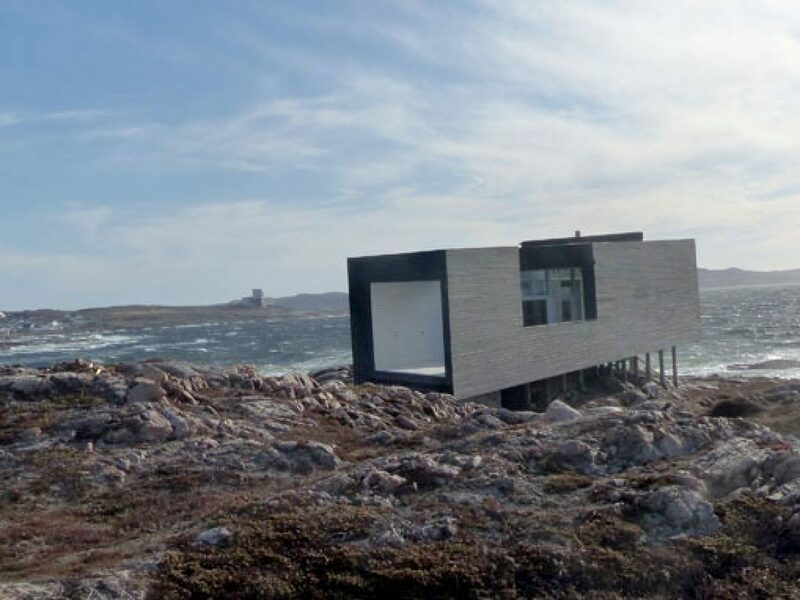 Our Head of Worldwide Product, Liz, recounts her perfect day on Fogo Island, a rocky outcrop in Canada’s rugged Newfoundland province and home to the award-winning Fogo Island Inn. A unique cross between Iceland and Ireland, this windswept rock in the Atlantic is rugged, quirky and utterly charming. 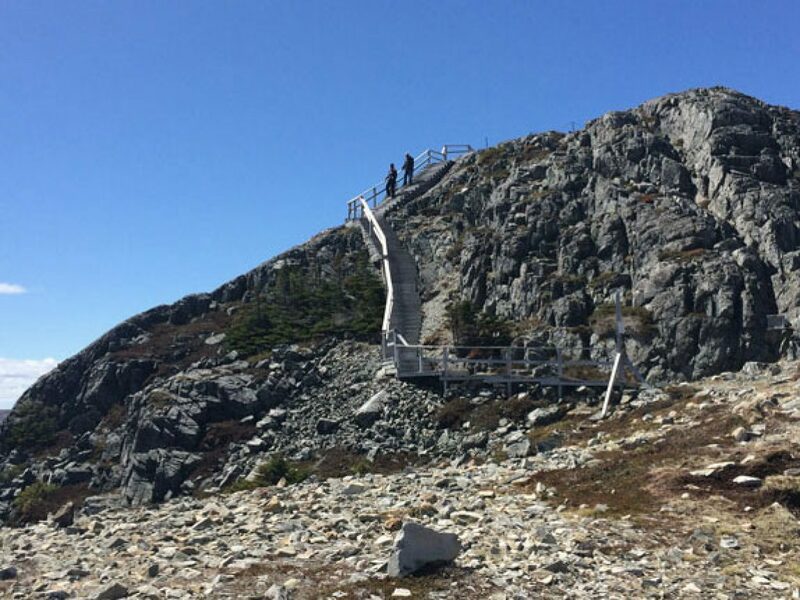 Fogo is located a 45 minute ferry journey from Farewell, on the main island of Newfoundland, and is home to some eye-catching architecture, lovingly tended hiking trails and some of the friendliest people you could ever wish to meet. Our first morning on Fogo was spent in the company of Donna, one of the locals who welcomes visitors to the island with an introductory tour. Unpolished but authentically ‘Newfie’, with an accent distinctly more Irish than Canadian, Donna delivered a truly personal tour. We not only saw all the key attractions, learning about the history of the island and its people, but also discovered where Donna does her shopping, who her neighbours are, what it was like growing up on Fogo and so much more besides! Together we trekked to the top of Brimstone Head, named by the Flat Earth Society as one of the 4 corners of the earth. Not entirely convinced by that, but the views were spectacular, looking across Fogo Island or out over the Atlantic, with countless icebergs glistening in the distance. Fogo sits in an area known as iceberg alley, where ancient and huge chunks of ice can be found drifting down from Greenland every spring. If you’re lucky you can spot both icebergs and whales at the same time off Newfoundland’s eastern shores – and yes, we were lucky during our trip with a most obliging humpback popping up right in front of an iceberg! That afternoon we set off on an independent exploration, hiking the trail to Joe Batt’s Point, past the Black Studio (Fogo is home to six remote and iconic studio buildings, where artists from around the world can apply for short-term residencies) and following the coast around to a windswept promontory. 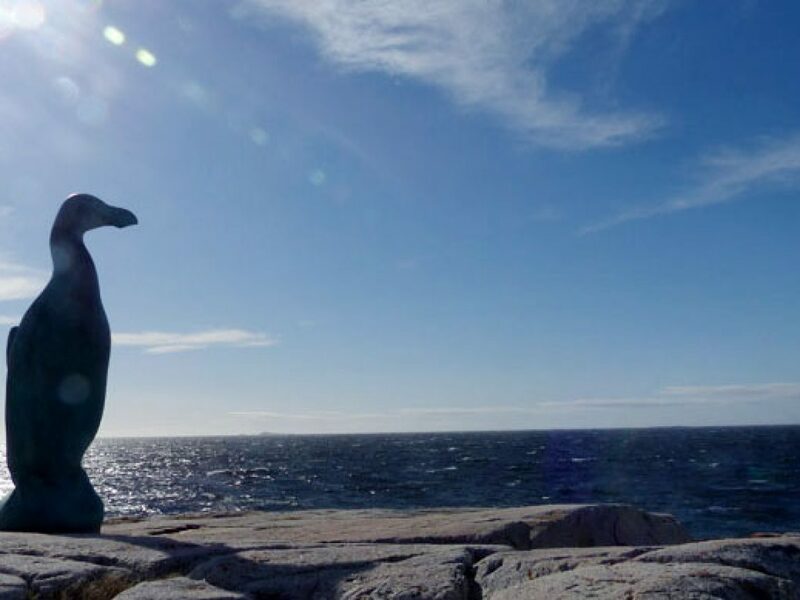 Here stands a bronze monument to the Giant Auk – no explanation provided, just an impressive sight! En route, we enjoyed a chance meeting with local man Jerry, brother of Colleen who we’d already met earlier. We stopped for a chat and Jerry asked us to test the new stone benches he’d just built – the trail was marked with carefully placed rocks, benches, boardwalks; a well-kept path making for an easy wander across the uneven terrain. 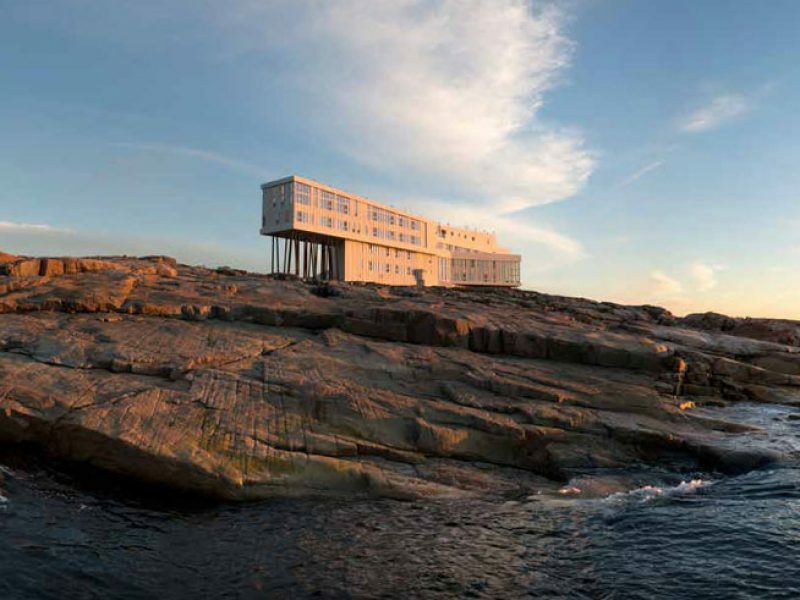 Retracing our steps from the Point we could see the unmistakable silhouette of Fogo Island Inn in the distance – a futuristic building that houses one of Canada’s best hotels. The Inn is the brainchild of Zita Cobb, an inspirational entrepreneur whose efforts via the Shorefast Foundation have created employment across Fogo and regenerated a community who, in the late 1960’s, were threatened with mass relocation off the island. The Inn’s profits are ploughed back into the local community – and all of this aside, it is simply an incredibly friendly, comfortable, homely place to stay where you very quickly feel part of the family. Sitting down that evening watching the sun set over the ocean through the Inn’s floor to ceiling windows, glass of wine in hand, local musician providing live music in the background, we really could not have asked for a more perfect day. 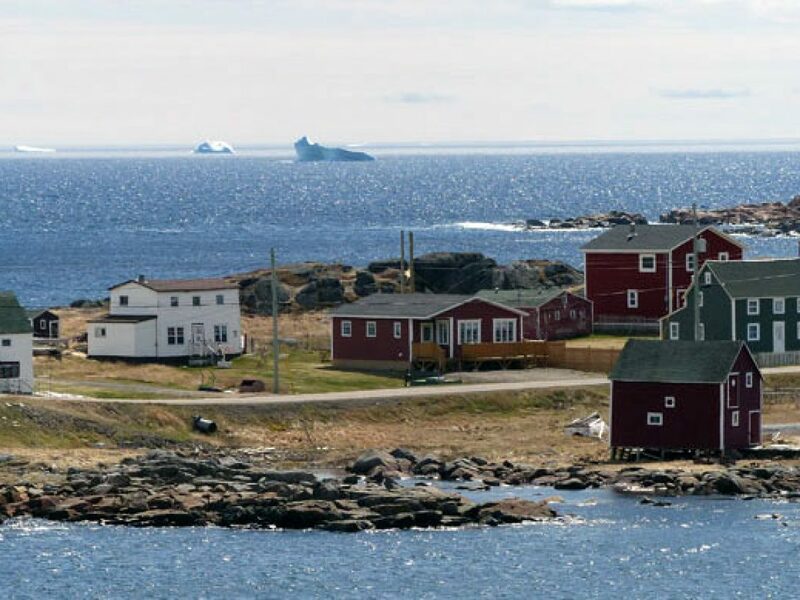 For your very own chance to experience Fogo Island, see our Fogo Island Adventure or to discuss your travel plans, contact our team of Canada Travel Specialists. Wildlife photographer George the Explorer shares his experiences from a recent visit to Quirpon Island, a little-known corner of Newfoundland and Labrador.